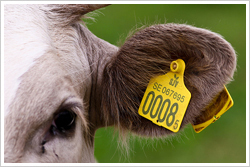 Ear tags are a simple and affordable way to track your cattle and other livestock. Accory offers top quality livestock ear tags for easy application. We also provide custom ear tags with your text, barcode and logo. Cattle ear tags are a simple and affordable way to track your cattle and other livestock. The cattle are tracked from birth to slaughter to help protect both the health of each animal and the health of the public that will eventually purchase the products made from that animal. Identification of pigs going for sale or slaughter is an essential part of monitoring for diseases and chemical residues. To protect human health and maintain public confidence in pig meats it is vital that any disease, chemical contamination or antibacterial residue is quickly traced back to its source. The Sheep Ear Tags, goat ear tags are ideal for sheep and goats. Popular snag resistant design of durable, weatherproof urethane plastic. The male and female parts could be one-piece set or two piece separately. Rabbit ear tags allows rabbits to be quickly and easily identified in show situations. Made of TPU plastic. The cow ear tags are made of quality materials and constructed as a new, one-piece tag. The easy one-piece application and self-piercing, pinhole tip means faster healing and reduced animal stress. The conjoined ear tags features female and male tag in one-piece set. All safety plastic construction witouout metal nail. The ear tag male studs are used together with the ear tag female parts. RFID ear tags can be used for electronicidentification of livestock. Transponder, which requires no battery and contains the indelible RFID identification code, is molded inside a thermoplastic material of high flexibility and resistance. The RFID Poultry Tag is suited for RFID management of poultry and birds for all types for tracking and scientific testing. Farm management can be fully automated for such processes as feeding, weighing, disease management, and breeding practices.